Bipartisan letter warns Kerry Russia's sale to Iran will remove US military threat, shows Russia can't be trusted in nuclear talks. A bipartisan letter from Congressmen was sent to US Secretary of State John Kerry on Tuesday, urging him to take all actions possible to block the sale of S-300 surface-to-air missile systems to Iran by Russia. The letter, signed by Congressmen Peter Roskam (R-IL) and Ted Deutch (D-FL), came after Russian President Vladimir Putin announced on Monday that he is lifting a self-imposed ban on the sale. 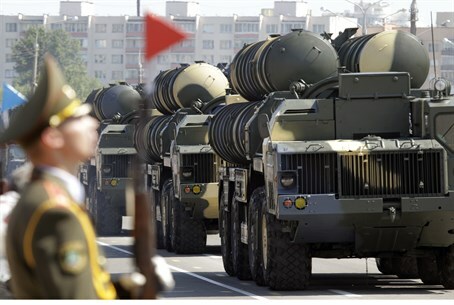 Russia's sale "will significantly enhance Tehran's military capabilities and threaten to further destabilize the region," warned the Congressmen in the letter, which was seen by Arutz Sheva. Noting on the risks posed by the advanced system, which can shoot down ballistic missiles and jets, they noted that "maintaining a credible military threat is a necessary component to prevent Iran from obtaining a nuclear weapons capability." "Allowing the Iranian regime to acquire this advanced system could significantly impact our ability to take military action against Iran, should this become necessary," wrote the two, warning the US may be unable to strike Iran's nuclear facilities if the Islamic regime makes a rush to produce a nuclear weapon. The Congressmen also noted on the timing of Russia's decision to revoke the 2010 ban, coming as it does days after a framework deal was reached with Iran on its nuclear program earlier this month, and ahead of a June 30 deadline for a final deal. "This news is particularly concerning in light of ongoing nuclear negotiations with the Islamic Republic of Iran and casts further doubts on Russia's role as a constructive partner in this process," they wrote. Roskam and Deutch, who back in September 2013 and January 2015 likewise wrote Kerry after reports that Russia was considering the S-300 sale, urged the secretary of state to "remain vigilant" and block the sale. The ban on the sale was made in 2010 after US President Barack Obama pressed Russia to desist, in what the White House touted as a "restart" of its ties with Russia. But Obama has apparently abandoned his "red lines," given that a senior Obama official back in 2010 said the sale is a "red line" which the US would be unwilling to cross. So far the US has not indicated willingness to take any action to defend those lines, with State Department spokesperson Marie Harf instead saying the sale won't have an impact on "unity" between the US and Russia in negotiating a nuclear deal with Iran. Prime Minister Binyamin Netanyahu called Putin on Tuesday to directly warn him against the sale, but Putin did not appear to be open to message, responding by explaining the "logic" of the move.